We got Romano beans in our CSA (community-supported agriculture) box this week, but in such a small quantity that it seemed like overkill to bring an entire pot of water to boil just so that we could eat them. 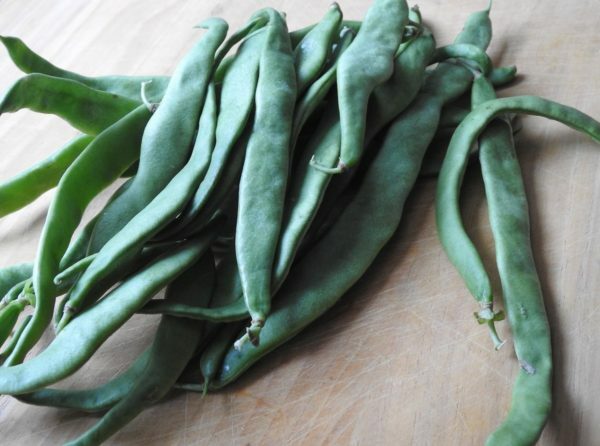 Romano beans, also known as flat beans, Italian pole beans, or fagioli a corallo, are large, flat green beans. They can be green, purple or yellow, but their green variety is paler than the other green beans typically available in supermarkets. They also have a milder flavor. I wasn’t sure if I could cook them in the microwave, but I wasn’t going to eat them raw, and I’d already decided against steaming them, so … that left the microwave. Romano beans have a milder taste than regular green beans. Some might even call it bland. So I didn’t want to eat them plain. How to doctor them up? I added clove of garlic and a little bit of nutmeg and salt before cooking them. This steamed the garlic, infusing the beans with its wonderful flavor. But the beans lacked color. A tomato might be nice, but I didn’t have any tomatoes. 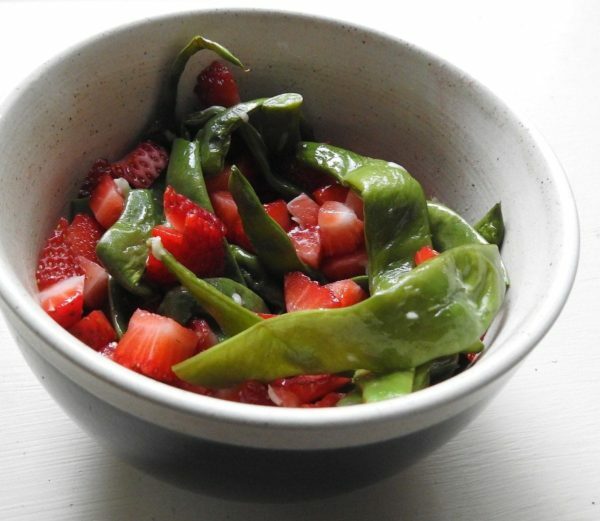 I had a lot of strawberries though, and they’re just as colorful and tangy as tomatoes. I was delighted with how this dish turned out. Too bad those were our only Romano beans, because this is good enough to eat every day. Romano beans usually need a slightly longer cooking time than regular green beans, but not by much. So keep an eye on your beans as they near the end of their cooking time, pausing the microwave to check on them if they look like they are getting limp. Rinse Romano beans and put in a microwave-safe dish with a peeled, whole clove of garlic. Sprinkle lightly with salt and freshly grated nutmeg. Drizeel with oilve oil and toss. Cover dish with a microwave-safe lid and cook on high, 5-6 minutes until bright green and softened. Remove from microwave and grate a little Parmesan, if desired, over top. As the cheese melts, stir to distribute evenly through the beans.